ASSOA Students Experience Civics and Citizenship first hand! Students came from all parts of the Northern Territory, including the Top End, close to the WA border, the Barkley region and Central Australia. Many of the students call cattle stations their home, but many also hail from remote communities, and one student lives at a remote ranger station. For one student from a small community, it was the first time she had been on a plane. She was very nervous before hopping on the plane, but enjoyed herself and is now a seasoned traveler! Along with their teachers, the students stayed at the Green Hills Centre in Canberra, which specialises in providing meals and accommodation to groups. They enjoyed their stay there, and even had the chance to participate in team building activities at the Centre. This trip was rich in learning opportunities for ASSOA students. A comment by one of the travelers was, “The trip was a lot of fun and there was heaps of cool stuff to learn, a lot of history and science”. 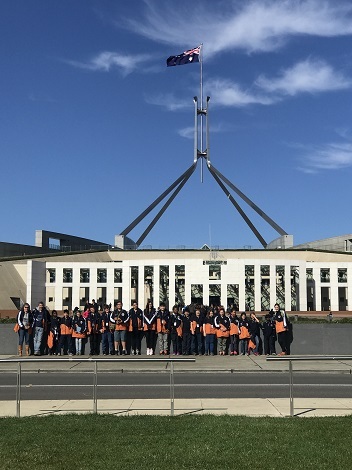 Apart from adding to the depth of their understanding about democracy in Australia and other key institutions, our students benefitted from the opportunity to enhance their social and teamwork skills, and deepen existing relationships.